Noga Holding System (Magnetic Stands) is used in many industrial applications, as well also in private life it is often required to fasten certain objects in a particular position. Noga Holding System offers the conventional two-arm system, in which a vertical column is connected to a horizontal arm by a swivel clamp, which allows tightening in any position. To the outer end of the arm, an indicator can be adjustably fastened. For most flexibility and freedom of adjustments, Noga Holding System makes the Articulated Holders, the main part if which are two arms connected by a swivel clamp. To the outer end of each arm, a ball-and socket assembly is attached. On Holding System, the bottom ball fits onto a base, and to the top ball a swivel clamp is attached. On Noga Holding System the top, center ad bottom swivels are all automatically locked in position by tightening one single screw. The most common base on the Noga Holding System consists of a magnet. For convenient handling the magnetic force can be switched on-and-off. When no ferrous surface is available, clamps or vacuum bases can form the base. On the top ball, of Noga Holding System, a swivel indicator holder is attached which will take indicators of any stem diameters, dovetail or others. In order to enhance accurate positioning of the indicator relative to the work piece, a fine adjusting mechanism is attached either to the top end of the arms, or to the base of Noga Holding System. Although the original design of the Noga Holding System arms was made for mechanical applications, they have proved to be very advantageous in many other fields, such as photography, medical instruments, scientific apparatus and many more. NOGA is proud to present its new line of holding systems. These state of the art mechanical holders, are divided into two groups, ARTICULATED and PH, both designed to hold dial and test indicators, as well as many other components. NOGA holders are also used in many other fields such as: machine construction, medical instruments, photography, light, sound and more. 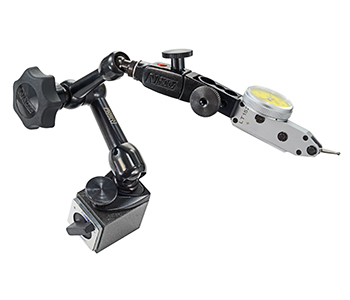 - articulated arms, with central locking mechanism. - post and arm, with unique 3 points clamp. Each group of holders consists of four sizes of arms, so you can always find one to suit your needs. NOGA holders have fine adjustment mechanism, whether it is on the top (FAT), or at the base (FAB). The plastic fine adjustment and the 2SM are now replaced by our top fine adjustment which is made of metal, and is the only fine adjustment to hold 6mm, 8mm, 3/8", dove tail and back lug.